Tiber Septim (2E 828[nb 1]-3E 38) is unquestionably one of the most important figures in the history of Tamriel. He was the first person to bring the whole continent under direct rule, and personally declared the start of the Third Era in recognition of the deed. His ancestors ruled Tamriel throughout the rest of the era. For such an important figure, it is remarkable how little is known of him. Even basic details such as his birthplace and original name are subjects of disagreement, as is the truth behind events like his accession to the throne and his success in later life. The fact that such contradictions and uncertainties exist seems to suggest that a deliberate attempt has been made to obscure certain details and expand the legend behind the man. Some facts, however, are agreed by all. With the name Talos, he served as a general and principal commander of the armies of Cuhlecain, king of Falkreath in Western Colovia. In 2E 852, Cuhlecain sent Talos to recapture Sancre Tor, which had fallen to a joint invasion by the forces of Skyrim and High Rock. Although the fort was believed to be impregnable Talos captured it easily, impressing the captured Nords into his army while selling the Bretons into slavery. In 2E 854, Cuhlecain was murdered and Talos replaced him as ruler of the empire, taking the name Tiber Septim at the same time. Tiber's armies suffered a few setbacks during their conquest of Tamriel. In Hammerfell, they supported the Forebears in their civil war against the Crowns but were defeated, although it wasn't too long before they were invited into the province by the victors. In Morrowind, Tiber was eager to avoid a direct confrontation with the powerful trio of living gods, the Tribunal. He agreed a truce known as The Armistice, which promised relative independence for Morrowind in exchange for nominal obedience to the throne of Cyrodiil. By 2E 896, all the provinces of the continent were under his control, and the year after, Tiber declared the start of the Third Era to mark his achievement. In around 3E 6, Barenziah, future Queen of Wayrest and Queen Mother of Morrowind, became pregnant by Tiber while she was staying with him in the Imperial City. Pregnancy for a Dunmer at the age of 17 was thought highly unlikely, and Tiber had believed such an event impossible. and insisted on the child being aborted to avoid any future issues with the succession. [nb 2] Tiber had married at some point before this event, and had at least one child by his wife. Tiber died in the year 3E 38 at the age of 108. He had no surviving children, and the throne passed to his only grandson, Pelagius. [nb 3] After his death, Tiber became a god and was thenceforth known as Talos. His apotheosis caused a name change for the existing Cyrodilic pantheon, and what had been known as the Eight Divines became the Nine Divines. From these bare facts emerge two contrasting stories about Tiber's life. The official story has him being born in Atmora under the name Talos, which means Stormcrown in the Old Ehlnofey tongue. He spent his youth in Skyrim, there learning the ancient Way of the Voice as well as the strategies of war from the local chieftains. At the age of 20 he led the invasion of Old Hrol'dan, taking it back from the Witchmen of High Rock. Soon after this it became known from the arriving storms that the Greybeards were about to speak. As the nearby villages were being evacuated, Talos, instead, made his way to the mountains where the Greybeards lived. When he arrived, the gags of the Greybeards were removed and when they spoke his name the World shook. The Greybeards told Talos that he would come to rule Tamriel and that he must go south to do so. Talos became General of the Colovian Estates under King, and later Emperor, Cuhlecain. General Talos met the combined army of Skyrim and High Rock on the field of Sancre Tor. The Skyrim army joined his when they saw him use the thu'um and knew him to be the son of Skyrim and heir to the Empires of Men. He was almost killed, along with Emperor Cuhlecain, in 2E 854 by a High Rock nightblade who slit his throat. Although he could no longer use the Voice, he went on to command Tamriel with a whisper. He took the Cyrodilic name Tiber Septim as well as a Nordic name, Ysmir, the Dragon of the North. Tiber Septim died in 3E 38. Born in Atmora under the name Talos, meaning Stormcrown in the old Ehlnofey. He spent his youth in Skyrim, there learning the ancient art of the Tongues as well as the strategies of war from the chieftains there. At the age of 20 he led the invasion of Old Hrol'dan, taking it back from the Witchmen of High Rock. Soon after this it became known from the arriving storms that the Greybeards were about to speak. As the nearby villages were being evacuated, Talos, instead, made his way to the mountains where the Greybeards lived. When he arrived, the gags of the Greybeards were removed and when they spoke his name the World shook. The Greybeards told Talos that he would come to rule Tamriel and that he must go south to do so. (This alternate story shares many of the details and events of the official version, but differs in key aspects.) Hjalti Early Beard was born on the island of Alcaire, in High Rock. Amidst rumors of a warlord destined to rule Tamriel, he rose to prominence in the service of King Cuhlecain and fought to unify Cyrodiil. Few knew of the existence of his secret ally, a long-dead Nordic king by the name of Wulfharth. Wulfharth masqueraded as the young general at crucial moments, winning battles and toppling fortresses with his legendary Thu'um. After the province was conquered, Hjalti murdered Cuhlecain and his contingent in the Imperial City and blamed the deaths and ensuing blaze on assassins from High Rock. Wulfharth continued to aid in his conquests, and Hjalti took the name Talos, ascending to the Ruby Throne. Tiber Septim appears to the reincarnate Nerevarine just before his reconquest of Red Mountain as an old man named Wulf, that no others can see. He gave the hero one of his own septims and gifted him with a greater power. ^ The date of 3E 6 is derived from The Real Barenziah, v 2, where Barenziah is described as being 17 before arriving at the Imperial City, and Biography of Barenziah, v 2, where she turns 18 as she leaves the city. The Daggerfall Chronicles dates her year of birth as being 2E 893, so her 18th birthday must have been in 3E 6. ^ Pelagius' relationship to Tiber Septim isn't totally clear. The Daggerfall version of Brief History of the Empire states that he was Tiber Septim's eldest living son, while the later version states that he was Tiber's grandson, as does The Arcturian Heresy. The phrase "eldest living son" is problematic, since it implies other living sons. If such sons existed, the throne would pass to one of them rather than Kintyra. It is easier to assume that this is a mistake and that the later text is correct. In The Real Barenziah, some passages suggest that Tiber had several children ("the mother of our children and future heirs" and "She matters little, it is true -- but her children love her") while others suggest just one ("Have you not noticed the coolness of the Empress and her son toward you? ", "all save the Empress and her son seemed captivated by her" and "Your issue would be a threat to my son and his sons"). These discrepancies may be explained if Tiber had one son and one or more daughters, although further assumptions must be made for the throne to end up with Kintyra. Boots of the Apostle When Talos Stormcrown was a young man in Skyrim, he went into the mountains to learn the secrets of the Greybeards. He learned the secrets of the high peak winds -- the roar of the winter blast, and the warm silk of the summer updrafts. When he descended from the mountains, he came riding the clouds, striding through the air in great boots he claimed were gifts of the Greybeards for his cunning craft and riddling. After Septim yielded his crown, the boots disappeared, and have been lost for many years. %PCRank %PCName, I have need of you again. I've been granted a prophecy of the Boots of the Apostle, a legendary treasure of Cyrodiil, relics of Tiber Septim who was also called Talos. ""Through the doors of Berandas, within the silent caverns, beneath the wings of twilight, dust sleeps in the shoes that Talos wore."" Recover the Boots of the Apostle and bring them to me. A Dunmer savant or Dunmer scout may have clues to the meaning of the prophecy. Morrowind history (hasphat antabolis) Caius and I always argue over the role of the individual in history. Is the individual shaped and controlled by history? Or can an exceptional individual shape history? Are individuals carried in the stream? Or do they dam and divert the flow? I say Tiber Septim changed the world. Caius says that Tiber Septim was a product of his time, and if he hadn't lived, some other person would have served his function. What about you? Are you going to change the world? Or just be carried by the flow? Priest Service (Imperial Cult) In his aspect of Ysmir, 'Dragon of the North,' Tiber Septim is also invoked as the patron of questing heroes. 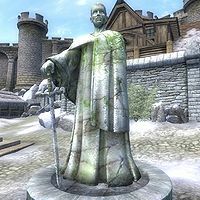 Healer Service et al (Imperial Cult) Tiber Septim, Talos, the Dragonborn, Heir to the Seat of Sundered Kings, is the greatest hero-god of Mankind, and worshipped as the protector and patron of just rulership and civil society. Check figure of 24th against Dynasty chart The Empire of Tamriel encompasses the nine Imperial provinces: Skyrim, High Rock, Hammerfell, Summerset Isle, Valenwood, Elsweyr, Black Marsh, Morrowind, and the ancient Imperial province itself, Cyrodiil. Dating from the First Era Cyrodilic Empire, the Empire is almost 4000 years ago. But more properly, the current Empire dates from the beginning of the Third Era and the crowning of Tiber Septim as Emperor of Morrowind over 400 years ago. The current emperor is Uriel Septim, 24th of the Septim line. Talos Cult They are a group that reveres Tiber Septim. It is not the group as a whole with whom I am concerned. It is rumors of a conspiracy within the membership that interests me. Talk to your fellow soldiers and see if you can find out more. We are those who worship the true following of the Legions. Protecting the Glory of Tiber Septim, Talos, the Dragonborn. Morrowind is one of the oldest civilizations of Tamriel. Once we were a nation of Dunmer, with our own Dunmer government, religion, and culture. Now we're part of the Empire, and citizens of all races live here, but because of the Treaty of the Armistice, and because Morrowind alone was never conquered by Tiber Septim's legions, of all the conquered provinces of Tamriel, Morrowind has best preserved its ancient culture and traditions. With a mere copy of the Anumidium, Tiber Septim was able to conquer all of Tamriel. Naturally in these troubling times, the new Emperor wants us to find any information we can on the original Anumidium. I have heard that the plans for the Anumidium rest somewhere in Red Mountain. If you find them, bring them to me. Julianos, God of Wisdom and Logic, is the deity of literature, law, history, sorcery, enchantment, and alchemy. Monastic orders founded by Tiber Septim and dedicated to Julianos are the keepers of the Elder Scrolls. Talos (Imperial Cult) Tiber Septim was born on the continent of Atmora with the name 'Talos'. When he became Emperor of Tamriel, he took[CRLF]a Cyrodilic name -- Tiber Septim, the Dragon of the North. A weird tale. And you say you have been marked by good fortune -- by 'the luck of the emperor' -- since you received the coin from the old veteran? Tell me -- did the face of the old veteran resemble the face on the coin? Did anyone else ever see this old man? I hesitate to suggest it. But I think you have been visited by an aspect of Tiber Septim. Surely this is a sign of a great doom laid upon you by the gods. MQ09ArmorTopic (Jauffre) An ancient relic of the first Emperor, who became the divine Talos, the patron of our Order. Yes, Baurus told you right. I am the Grandmaster of the Blades. We serve the Emperor and the Septim bloodline. Talos is our patron. You wonder to find me here? Discretion is our watchword. Only a few of us have the honor to serve publicly in the Imperial Guard. Prior Maborel Greeting Welcome to Weynon Priory, a monastic retreat dedicated to Talos and the Nine Divines. Our Order works to spread the teachings and worship of the divine Talos. It isn't widely known, but many brothers of the Order of Talos are also members of the Blades. Chapterhouses of the Order, like Weynon Priory, provide safehouses for travelling Blades as well as our more public religious functions. Blades who are too old for active service often join the Order as lay brothers. We are honored to have Grandmaster Jauffre, or Brother Jauffre as he prefers, as a resident here. We are a monastic order devoted to divine Talos, who was the mortal Tiber Septim, the founder of the empire. The Emperor's elite knights. They dedicate themselves to Talos above and the Septims here on earth. The priory is a chapterhouse of the Order of Talos. And with the last Septim emperor dead, and all his heirs... Tiber Septim is the god and patron saint of our order. And now his dynasty has come to an end. It's very painful. I was just here reading the Black Horse Courier about the assassination, and looking through 'A Short Life'. Uriel was an old man... a good man, and a good emperor. Why would anyone want to kill him? And all his sons? Weynon Priory is a monastery devoted to the praise and worship of Talos and the Nine Divines. Brother Piner, Father Jauffre, and I are members of the Order of Talos. Eronor, a lay brother, tends after the sheep and our little farm. Sir Roderick Greeting Talos, the Dragonborn, patron of questing knights, will surely look with favor upon us. Walk with me to his shrine, if you will. The Prophet As a proven guardian of this realm and a warrior the likes of which have not been seen in millenia, Talos grants you his sacred Blessing. Alessia! Reman! Talos! They cry for blood akin to theirs to rekindle the dragonpact! Citizens, take to your knives! And Talos said to the Arctus, "Let us join as one to fortify this throne, this land, these people, each one glorious under heaven!" Aye. With the apotheosis of Tiber Septim, the face of the divine was transformed. Talos ascended and the Eight became Nine. Just as the Eight aided Pelinal of old, now the ascended One, Talos who was Tiber Septim, provides his Blessing to you, the new Crusader. Rumor I confess, I didn't think we had a chance against the daedra. But Martin proved himself a true heir of Talos on that day. Brother Piner The Blades are closely linked to the Order of Talos. We both serve Talos, of course, and many of our brothers are former Blades. I myself was training as a Blade when I received the call to serve Talos in a different way. Like members of my order, the Blades are devoted to the divine Talos. We honor them for their dedication and devotion. We're a Nine Divines priory dedicated to the Order of Talos. Lord Talos teaches us to be prepared to protect his people in peace and war. I'm on night watch here, in case someone needs the chapel, or wants to talk... or has mysterious business, like you. I was just writing a letter to my mother. She's quite upset by the assassinations. MG Lecture Before Tiber Septim, Cyrodiil's roads varied greatly in quality, and were often impassible in bad weather and winter seasons. After the Battle of Sancre Tor, Tiber Septim gave his armor to the Blades in honor of our role in his victory. The Blades built a shrine in the catacombs of Sancre Tor, on the spot where Tiber Septim received the blessing of Akatosh. Ocato You have earned the highest rank possible in the Order of the Dragon, the illustrious order of Imperial knights founded by Tiber Septim himself.